35 bottles were made with 100% of the proceeds going to the Bethesda Project (a charity benefiting Philadelphia-area homeless. Each 500mL bottle is sealed with wax from by the same bees who produced the Pine Barrens honey used in the beer itself, which is a double india black ale hopped with with Mosaic, Simcoe and Nelson Sauvin. 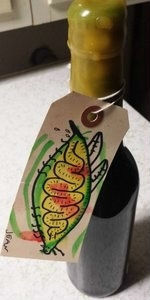 Every one also comes with a unique tag featuring a watercolor and ink drawing by owner/brewmaster Jean Broillet IV. This beer was one of my first from TH and was awesome. Roasty, hoppy, with a great smoothness from the honey. Please do this again, TH!! huge thanks to rudzud for this once in a life time rarity. Pours a nice fizzy bubbly dark head that barely covers it, decent lacing, nice legs too, just about pitch black color. Good swirl brings a nice creamy head, nice smooth rich looking pour. Nose brings big pine and little orange peel citrus, mild mocha, cocoa, coffee, little dark caramel, very light chocolate, quite a bit of pine, and hint of honey in the background, and very light fluffy chocolate nougat. Taste brings more pine and citrus, nice piney little tree sap, little resin, etc. Some dark malts, creamy mocha, hint toasty coffee, hint choc, etc. Honey starts light then really ramps on the finish, big fresh heavy raw honey, even little honey comb mostly late the finish. Also little lingering caramel cocoa and creamy mocha, mild on the dark malts, more pine and citrus, pine sap, and a big honey on the late finish. The finish is like chewing on honey comb wax. Mouth is med to heavier bod but soft and creamy, nice carb. Overall amazing, so subtle and well finessed, nice ipa with pine and citrus, light on the cocoa mocha and caramel which is nice, the honey is phenomenal too. Shared this with JLindros. Bottle number 35/35. A - Poured into a Kate the Great tulip and am almost grayish brown when pouring though one in the glass it resumes a normal brown/black with a one finger light mocha head that had nice legs. Quite nice. S - Aromas of super light chocolate, nice pine needles, nice citrus (grapefruit and tangerine) , nice faint honey sweetness. A lot less "black" aromas than I'm used to in a black ipa. Alcohol is hidden very nicely for a 9% ABV. T - Taste is more of those bright pine needles and grapefruit. The roast is faint as is the chocolate. The honey is in the background offering a nice sweet backbone but never cloy almost earthy. Really like the subtlety here with nice very good quality honey on the finish that just lingers more and more. Really nice. M - Mouthfeel is very nice, super drinkable with the ABV hidden excellently. Creamy and smooth. O - Overall while I feel this was not the typical black ipa, as most are really roasty, this though is nice and hoppy with really nice honey sweetness. The ABV is hidden so well. Awesome beer.